The US Mint's sixth and final release for the D.C. and American Territories Quarter series will be the Northern Mariana Islands Quarter on November 30, 2009. This series followed the state quarter series which ran for several years previous to 2009. The Chamorro, natives of the islands, were first met by European settlers when explorer Ferdinand Magellan arrived in 1521. Hostile relations did not prevent the Spanish from obtaining control of the islands until 1898. In 1668 the islands were renamed Las Marianas after Mariana of Austria, widow of Spain's Philip IV. The Spanish-American War resulted in the neighboring island of Guam being ceded to the United States in 1898. This same year, Spain sold the Mariana Islands to Germany, which retained control until the islands were invaded by the Japanese during World War I. Still in the possession of Japan at the start of World War II, they used the islands as a base to attack US forces on Guam almost immediately after Pearl Harbor. In 1944, the US regained control by force of most the islands. By the 1970's, the population of the island decided to initiate a closer relationship with the United States, and became the Commonwealth of the Northern Mariana Islands. As a commonwealth, they retained their own independant government, but forged a political union with the United States. Also available in 2009 as part of this series are the District of Columbia quarter, the Commonwealth of Puerto Rico quarter , the Guam quarter, the American Samoa quarter and the U.S. Virgin Islands quarter . All will be minted in quantities to meet demand. 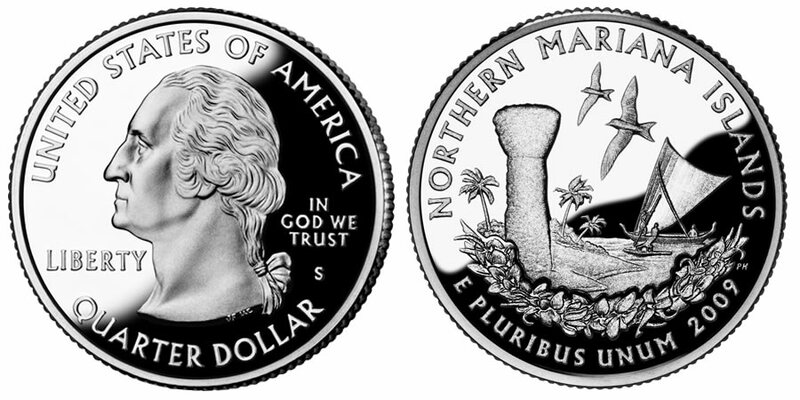 Sculpted by Phebe Hemphill , the Northern Mariana Islands quarter reverse design represents the wealth of the islands in its natural resources of land, air and sea. A large limestone Latte (an architectural structure from ancient Chamorro times) stands near the shore. A canoe is present to represents the people’s excellent seafaring skills. Two white fairy tern birds fly overhead while a Carolinian mwar (head lei) borders the bottom of the design near the inscription, NORTHERN MARIANA ISLANDS. The mwar is present as a symbol of the virtues of honor and respect.